It’s funny how a brewery that has been around for almost a decade can seem like the nubile young thing on the block when it first arrives in your distribution region. I can only imagine that this is how certain Atlanta residents have felt recently about St. Louis’s 2nd Shift Brewing, which has been available here in recent months as part of a very limited deal that has seen the brewery pop up at a few festivals and special events, in addition to their more permanent distribution in the St. Louis area, the Chicago area, Washington DC, Virginia, Delaware, and Maryland. To me, though, 2nd Shift seems more like an old friend with whom I’ve recently become reacquainted. Before joining Paste’s Atlanta offices in 2014, I worked in the hustle and bustle of daily newspapers in Illinois, and regularly made trips down to the vibrant, perpetually underrated city that is St. Louis. Whether it was for concerts, or some of the best BBQ I’ve ever consumed, one of the constants of these trips was a deep exploration of the burgeoning St. Louis craft beer scene, which kicked into high gear around 2010 or 2011 with a flurry of openings. But 2nd Shift? They always had a tendency to be slightly overlooked. Why? Well, the primary reason was that they didn’t have a brewery in the city proper. Rather, the primary brewery for 2nd Shift was in the tiny town of New Haven, MO (population: 2,089), located an hour’s drive west of the St. Louis outskirts. That meant the only place to reliably find wonderful 2nd Shift beers such as Cat Spit Stout or El Gato Grande was in the city’s beer bars or restaurants, and that was something a visitor like myself was somewhat less likely to do while visiting for 24 or 48 hours. That all changed in 2016, when 2nd Shift moved to St. Louis’s classic Italian-American neighborhood The Hill, and set to reintroducing themselves to their biggest market. 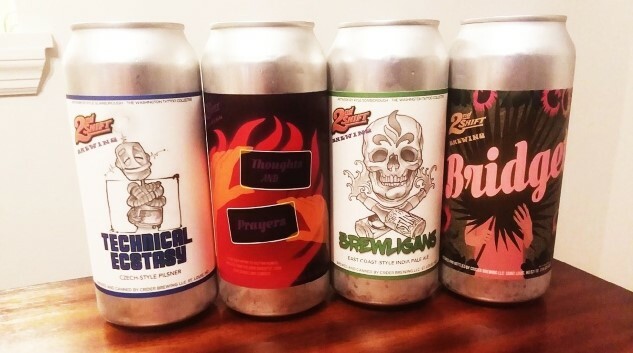 Today, nine years after they started, 2nd Shift’s output feels fresher than ever—and so, I figured now would be a good time to taste a lineup of their beers. So let’s get to it. This beer is confusing mislabeled as a lager in a few places online, but as soon as you pour it and take a sip, it’s obvious this isn’t the case. Rather, this beer, brewed to raise money for local St. Louis schools and teachers, is essentially a classical English mild ale. And when we say “mild,” we mean mild indeed. Thoughts & Prayers is extremely light and very delicate on both the nose and the palate, with slight impressions of nuttiness/roasted nuts, cocoa powder and a hint of black tea maltiness. Weighing in at only 3.2% ABV, this stuff is exceedingly drinkable and very light of body. It’s the kind of beer you would expect to be served in an imperial pint, if not a liter stein, which might be even more practical. If anything, it could stand to be slightly more assertive, but when you’re dealing with an ABV that is almost under 3%, this is to be expected. Regardless, this is basically the beer to pound on your lunch break, before heading back to the office. Perfect name for a pilsner, is it not? Any great German lager is a work of technical beauty, and this one is no exception. Of the four beers I sampled here, this Czech pils is perhaps the most impressive—a very subtle, thoughtfully composed take on the style that flies in the face of how many American brewers are currently making pils. On the nose, this beer primarily shines through with delicate malt character. There are bready/doughy notes, a very slight sweetness and touches of lightly floral and herbal hops—but not necessarily the hop-forward profile one might expect. The same thing holds true on the palate, where subtle, yeast-derived flavors are paramount—bits of crusty bread and crisp, crackery malt, with a slight corny sweetness and just enough hops to let you know they’re there. It’s as dry and drinkable as you would no doubt expect, with less bitterness than many examples of the style. Everything seems geared toward drinkability. Indeed, I actually found myself sort of surprised by how much I was enjoying Technical Ecstasy, as I typically gravitate toward pilsners that are more assertive in their noble hop flavors—something that was reflected in our blind tasting of 134 pilsners a few months ago. This one, though, truly favors balance above all else, putting the onus of flavor onto the subtle interplay of malt and hops. One of 2nd Shift’s newest beers is Bridget, a funky, brettanomyces-heavy, session-strength wild ale that is aged in the brewery’s foeders. This one is dazzling in its sheer array of wild yeast-derived flavors, especially considering the modest ABV of 5.4%. On the nose, there are so many disparate notes that it’s difficult to isolate them, but I get distinct impressions of kiwi, mint, pine and blueberry. At the same time, this strikes me as exactly the kind of beer that will be interpreted differently by nearly everyone who samples it, given the variations of each person’s palate. As for me, I appreciated the high degree of complexity present in this funky beer as a total package. There’s a moderate amount of wet oak flavor on the palate, but not much in the way of overt “tartness”—it’s certainly more funky than it is sour. In this department, it actually reminds me a bit of Monday Night Brewing’s Beyond the Clouds, a brett beer that finished in the top 10 of our blind tasting of 324 IPAs. That’s certainly not a bad comparison to garner. This take on hazy IPA was the one beer of the bunch that didn’t leave me quite as impressed with the subtlety of the entire concept. Brewed as a collaboration with the fan club of the St. Louis Football Club, it features plenty of Citra, Centennial and Cascade, and weighs in at 6.5% ABV. The nose is heavy on citrus, but it has an “overripe” quality that I don’t find appealing, along with a hefty dose of something I’d describe as “tropical tea,” and a corresponding vegetal note. Bitterness is quite low, as you’d expect to see in most NE-IPAs these days, with flavors on the palate that segue into kiwi and grassiness, and perhaps a bit of something like honeydew. Overall, this one seems close to the mold of what is being sought after by many breweries right now, but it doesn’t quite nail it in the way that some others do. Given the choice, I’d reach for 2nd Shift’s own, more classic Gato Grande IPA. That brings our four-beer tasting to a close, but I hope that the Atlanta area will be lucky enough to continue seeing occasional 2nd Shift beers, from time to time.